I have explained before, I think, that I take selfies with my cats to send to my husband sometimes. Yeah I did, because I remember explaining how bad I am at selfies. Well, this is further proof! This is Nessa in her tower and I managed to get my eye! I am sharing this picture of our cute little girl for today’s Friday Photo! This entry was posted on November 30, 2018 at 6:48 pm	and is filed under Friday Photo. 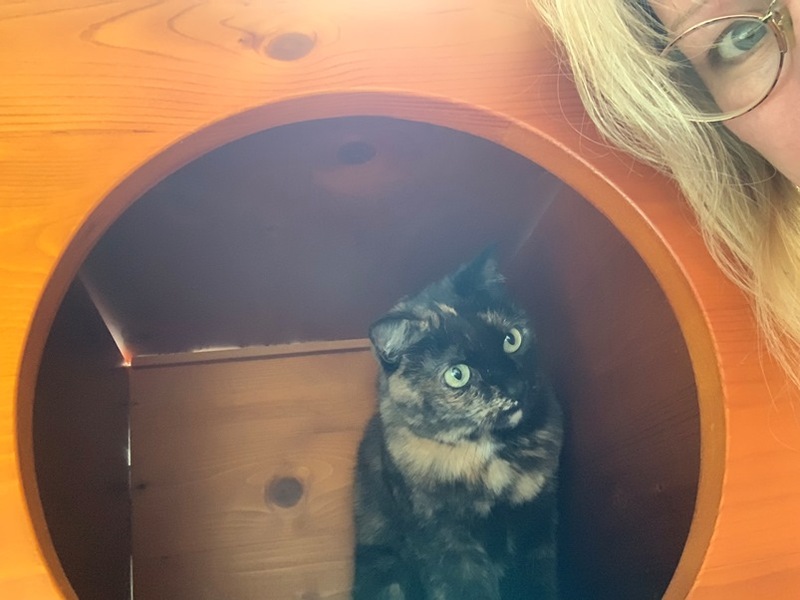 Tagged: cat tower, Friday Photo, Nessa, selfies, selfies with cats. You can follow any responses to this entry through the RSS 2.0 feed. You can leave a response, or trackback from your own site. That’s a very nice photo. I like the pensive way she is looking at you. The knots in the wood seem like eyes as well as the round opening. Thanks, she is a sweetie! It’s an enigmatic picture, just like cats are, so very apt!